You may have heard that Missourians are known for being skeptical, which is why Missouri’s nickname is the Show Me State. If you are one of these skeptical Missourians, there is one thing you should not be skeptical of—the availability of financial aid for Missouri residents. Students from Missouri have a lot of opportunities to receive scholarships, grants, and tuition aid. From a full ride to the University of Missouri to need-based grants, Missouri residents have a lot of tuition aid to take advantage of. Let’s take a look at the steps you should take to make paying for college a reality. While you may still be unsure about paying for college, you can be sure about one thing: the FAFSA is the first step towards getting tuition aid. The FAFSA, also known as the Free Application for Federal Student Aid, is the government’s way of distributing need-based financial aid to students going to college. The government gives over $150 billion to students like you in the form of grants and loans, so make sure you don’t miss this incredible financial opportunity. Further, you should apply for FAFSA before you apply to schools because many institutions use this form to determine how much financial aid they will give you. It’s easy to see the benefits of the FAFSA, but the application is not all fun and games. The FAFSA is notorious for being confusing and lengthy. That’s why we created this step-by-step guide to completing the FAFSA questions. With our guide, applying for federal financial aid will be easier than ever! Believe it or not, just by being a resident of Missouri, you have scholarships and grants that you may be eligible to receive. The Missouri Department of Higher Education’s website is the first place to find these financial opportunities. The Financial 101 section of the website can be useful when getting acquainted with new acronyms, types of financial aid, and where to search for financial aid. Their website also includes a list of all of the scholarships and grants that you can apply for. Let’s take a look at some of the scholarships available to Missouri residents. Bright Flight Scholarship is a merit-based financial program for top students who want to study at a Missouri college or university. A+ Scholarship is for students who are graduating from a A+ designated high schools and who plan on attending specific community colleges or vocational/technical schools in Missouri. Marguerite Ross Barnett Memorial Scholarship provides financial support to students who are employed while attending school part-time.. Minority Teaching Scholarship grants financial aid to academically gifted minority students who wish to pursue a degree in teaching. There are also many grants that are offered to Missouri residents. Access Missouri Grant gives need-based financial aid to students who plan to attend certain colleges and universities in Missouri. Advanced Placement Incentive Grant aids students who have achieved a score of three or higher on two or more AP exams in math or science. Kids’ Chance Program is for students who have a parent that was seriously injured or killed in a work-related accident. If you’re still in high school, schedule regular check-ins with your high school guidance counselor. They can often suggest local scholarships that you may be eligible for. You can also search for scholarships online through any number of search engines, such as CollegeScholarships.com (which lists a whopping 116 scholarships for MO residents). Try searching by major, extra-curricular activities, nationality, or any other characteristic that sets you apart. The institutions that you wish to attend can also be excellent sources for funding. For example, Missouri State University provides funding for students involved in specific activities. The Student Government Association Leadership Scholarship provides financial aid to students who are members of student government. Similarly, students who work as on-campus Resident Assistants (also known as RAs) will receive room and board as compensation for participation, and Resident Programming Assistants will receive housing as compensation. Missouri State University also offers work-study positions for students who are willing to work while attending school. Additional scholarships include departmental and donor scholarships that students can apply for. The University of Missouri (or Mizzou) also provides many financial aid opportunities to incoming students through scholarships and grants. One of the largest scholarships includes the Stamps Scholars Program, which is a scholarship that awards five full scholarships to high-achieving students who exemplify leadership, scholarship, and service. Mizzou also offers the George C. Brooks Scholarship to students who are of an ethnic group underrepresented at the university. Further, veterans can apply for scholarships through the Veterans Center at the University of Missouri. Finally, the Mizzou Scholars Award gives $10,000 per year specifically to Missouri residents who are academically distinguished. Besides all of these amazing financial opportunities, students can also apply for general scholarships and departmental scholarships. Note that some scholarships at Mizzou require students to fill out the MU Annual Scholarship Application after applying for admission. These are just two schools that offer financial aid but, as you can see, there are so many opportunities to receive funding. Make sure you research any and all financial aid that is offered by the institutions you apply to. To do this, go to the school’s financial aid section of their website and research away! If you’ve reached step four and are still unsure of how you will pay for your entire college tuition, you can still make higher education a reality through private student loans. Since college is such a huge financial investment, you don’t want to pay more than you have to. 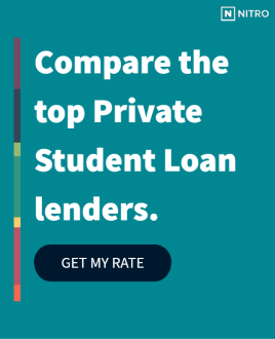 That’s why we found the best banks for private student loans to help you get the best rates available to finance your education. Further, you can use our NitroScore tool to help forecast what your student loan payments will look like based on your projected post-college finances. Now that you have the tools to start thinking about college financing, you have all the tools you need to start creating your college funding plan. Good luck!